Adidas is a company that loves the spotlight, being the center of attention, and they certainly like to make things dramatically interesting. Case in point the X15, a boot developed to be the ultimate weapon for the game’s most dangerous players. In order to take this fresh release to market they had to shake things up and retire some of their most influential boot silos, shocking a few million fans in the process. What a gamble to take; one that has a serious make or break feel about it. 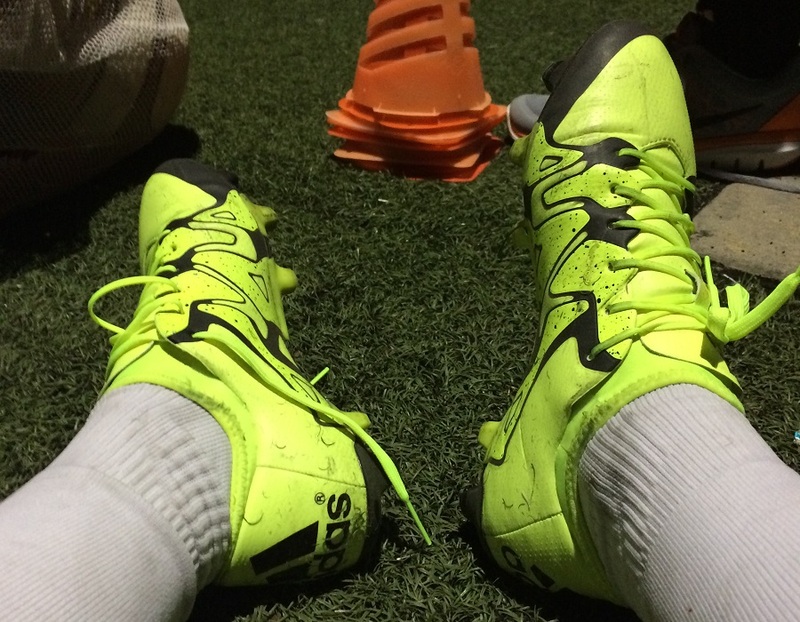 We’ve had the boots for a few weeks now, putting them through their paces to see exactly what they have on offer. We also had the opportunity to speak with lead designers in the boots creation, and we have devoured more than enough PR content to understand adidas took this direction. The result is one of our most in-depth (and somewhat provocative) reviews to date. 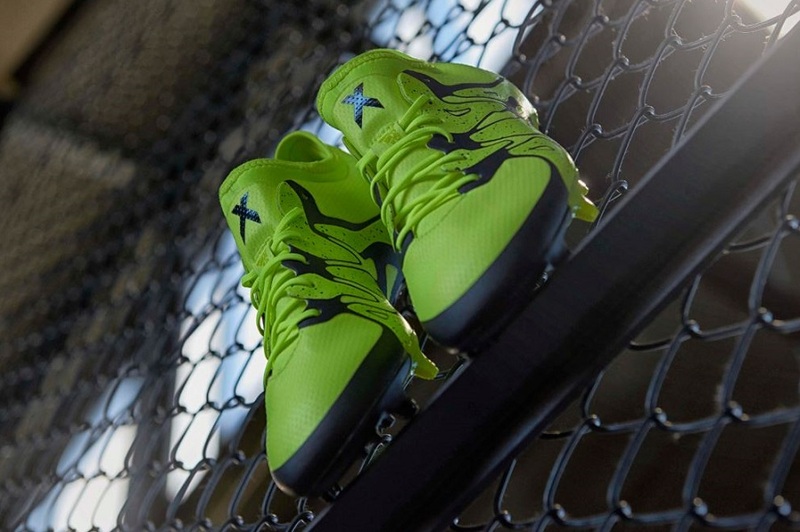 Find the Adidas X15.1 available at soccer.com. For the Champions League Final, we flew to Germany and took advantage of checking out “The Base”, a new adidas soccer inspired location in Berlin. As much as we wanted to get out onto the hard courts and play, it was meeting the boot designers that drew our immediate attention. Through those conversations, we learned a lot about the new silos, including the fact adidas set out from the beginning (4 yeas ago) to revolutionize the market and create something that hadn’t been seen to date. We hadn’t tested the boots up to that point, so everything they had to say made complete sense. Has that changed? Continue reading to find out! There is nothing better than slipping your feet into a new pair of boots without socks on and experiencing a super soft, loving touch feel. That is what you get with the X15, as they immediately set about hugging your feet. From the beautifully lined heel, which features some sort of memory foam material, to the Techfit collar and its ultra snug fit, there is a sense of reliability about these boots right from the beginning. One thing I did notice though, was that they are tighter than a traditional boot and that comes down to that heel lining. It is extra thick and padded, which is perfect for containing your heel and providing a cushioned fit. But, that proved to be problematic in my case as it made things just a little too tight toward the front of the boot. Starting out, they felt pretty ideal and I was applauding the comfort level, but the extra pressure plays a toll over time and the motion of being tight in the boot created a negative friction connection. My heel and the knuckles of my toes felt slightly……I want to say “raw” but that seems over the top…..so I’ll go with “emotionally disconnected” after the first 60 minutes of games. This reaction repeated through the first few games/sessions and I had to continually switch out of them them. The one evident thing is that adidas has placed a strong emphasis on comfort and they haven’t skimped on the materials used. But, it is important to focus on getting the correct size if you want to get the best out of these boots, more on that down below! Before release, all talk focused on the higher than normal collar cut and its similarity to Nike’s mid-cut collar. Straight up, it is nothing like the mid-cut collar and its role on the boot is very different. The Techfit Collar sits slightly higher than a normal ankle line cut, with the purpose of providing a more secure and snug fit around that region. It is not intended to create an “as one” fit with your leg. Instead, it simply secures the fit and ensures the boot is tight in the right spots. Important to note, the material has plenty of stretch to it and it is very soft, so there is no concern at all with discomfort. No matter the size of your ankle, as long as you can get your foot into the boot, it will provide a secure fit. I personally see this as a positive addition to the boot market and what adidas has on offer. As for the actual cut, it has been trimmed to encompass the upper region of your midfoot to ankle only, so it doesn’t envelope your entire foot or trap warm air inside. Underneath the tongue, it is stitched in place to ensure it doesn’t shift or move. This is the area where we focus in on the upper material and its role in the boots performance. Adidas developed and all new material called X-SKIN that is made up of a complex three layered system designed to deliver comfort, protection and performance in any conditions. Touch it for the first time and you can immediately make out 2 things; it is durable and it features a dimpled texture for added control on the ball. Up close, it has a zig-zag style design with a dual density making up the construction. It has the appearance of a single layer material that features a lined tape across it. Then the miniature raised dimple texture has what I’d compare to the feel of a gentle sandpaper. It is less sticky and more light control – in play, they are ideal for dribbling and taking players on. When matched with the agility focused soleplate, you get a boot that is pitch perfect for getting out of tight spots with quick turns and chops. In terms of shooting, the extra friction across the forefoot also has its benefits. Connecting with the ball, you can get a little extra spin from the added grip making them an ideal option for players that like to place shots towards either post. The X-SKIN material is also thick enough to reduce impact as you strike solid shots. The final positive comes in the form of a treatment known as Non-Stop Grip (NSG), which aids ball control regardless of weather conditions. There is also the reinforced X-Cage designed to keep the balance between a lightweight boot and one which offers the support a player needs on the pitch. 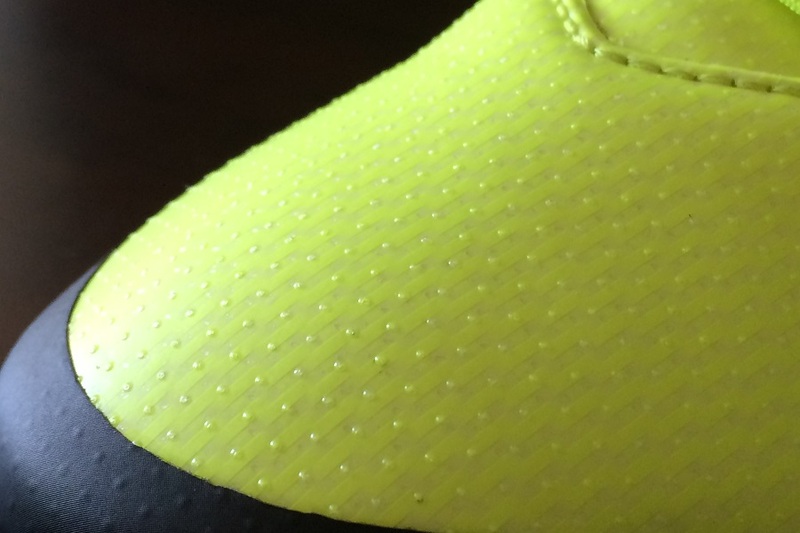 This is basically the funky design that sits on the medial and lateral side of the boot. Yes – it actually has more of a role than just being a visual indicator. Since it runs through the lacing, you get a system that pulls right in around your foot to increase the fully functional “perfect fit” concept. Some players can never be controlled. They are the spark that ignites a game. They defy rules and structure. The moment of genius that gets the crowd off their seat – that’s their specialty. There is no defense and no tactic that can control them. These players are specialists in chaos. Thomas Müller, Gareth Bale, Luis Suárez, Karim Benzema and Álvaro Morata, these players strike without a moment’s notice. Realistically, I’d compare these as being a hybrid between the Predator and F50 series, even if they lack any evident “power” elements. It seems like adidas wanted to create a very attack minded boot that would allow players a more lightweight option without the need for extra tech around the forefoot. Thus, their speed matched with playmaking allows for a dual performance release. How does this particular stud configuration play out on both surfaces? Pretty well actually. The X-CLAW base is built to give complete traction with a lightweight feel. On FG, they are pitch perfect and I’m all about the smaller nubs that line the inner lining of the plate. 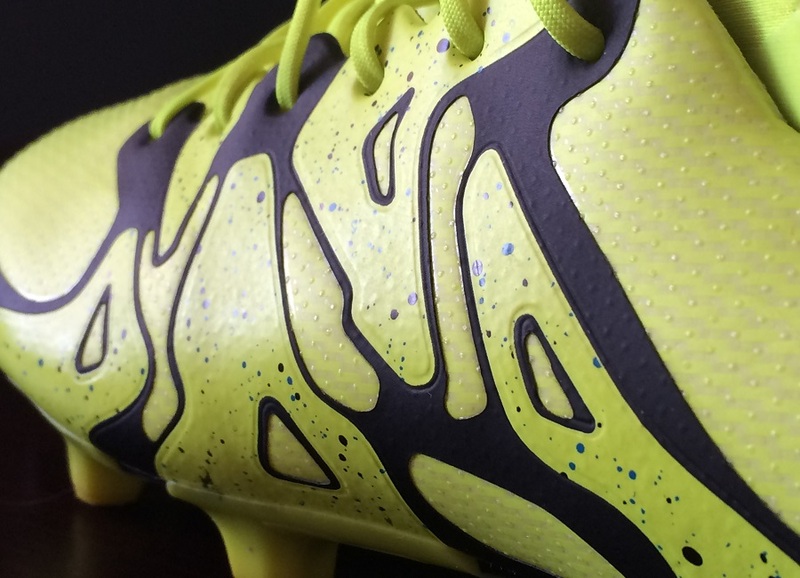 This is a boot that is less about straight-line speed and more in tune with changing direction at speed. The addition of that inner line seems to create a more dynamic motion and connection with the surfaces. So, for example, lateral movement seems much more supported as your foot connects, grips and releases from the surface. You get the similar positive results on AG, although it is really dependent on the quality of the surface. If you are playing on a newer, softer surface, they will work really well. I had the chance to test them on a semi-height AG material, with little spring to it. And I wasn’t impressed. My recommendation is to strongly consider where you will be playing with these boots. If it is a newer material, they are a lock-in. But if you know that there is a possibility of older materials with less bounce, stick with a more reliable low profile conical stud config. 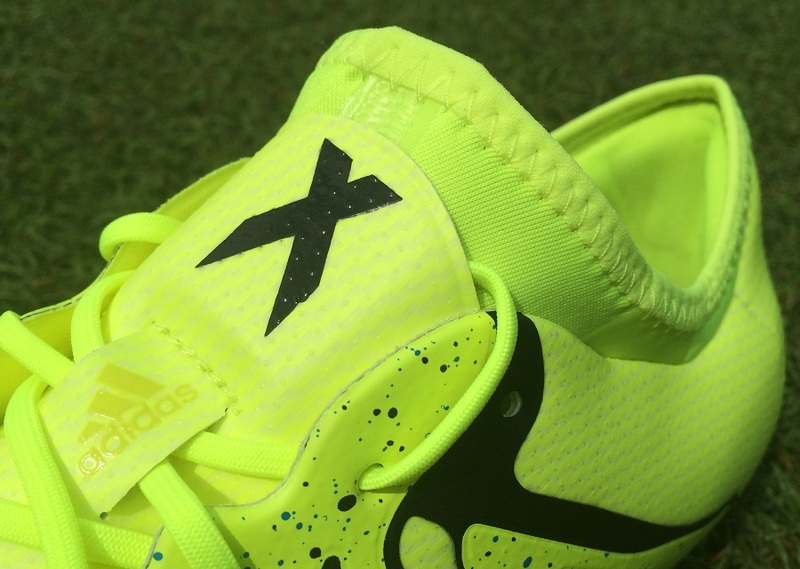 Adidas has taken the “snug” approach with the X15, insuring that they fit tight right around the foot. Width wise, they are a fully functional medium width, with a little extra stretch to get them into the wider fit category. Compared to the Ace15, they fit slightly narrower. And the same is true in length, where the X15 almost fits a half inch too short. Your toes will be right up against the front of the boot – something I’d attribute to the heel being a little extra padded. Should you order up a half size? In the synthetic version it really isn’t a bad idea. If I was to purchase a pair, I’d definitely consider the option of increasing the overall length of the boot, with hopes that it didn’t impact how they felt width wise. Here is the thing; adidas set out to create something revolutionary; something that was created to keep pace with a faster, quicker style of play; something that adapted to the modern game. Have they done that? The answer is a definite YES. These boots are completely different to what we have seen before and performance wise, you get something that is unique. But, and this comes with a big BUT, are they better than what was on the market? My answer to that would be a concise NO. They are different, but they are very much on par from a performance perspective with what we have seen. Continuing being a critic, how does it help players and the market, to downsize from 4 silos to 2. Doesn’t that deselect a section of the market who relied on a particular trait with a specific boot. For example, where do Nitrocharge fans go? And what if Arjen Robben is not ready to switch to the Messi15, a boot named after a competitor? Their choice has basically been eradicated from the market. The question then is “what should adidas have done?” One response would be to introduce these new boots with the prior 4-boot line-up and let the market decide which boots should stay and go. That makes sense in one regard, but it would also have overloaded the market. Another suggestion is use them as new silos. 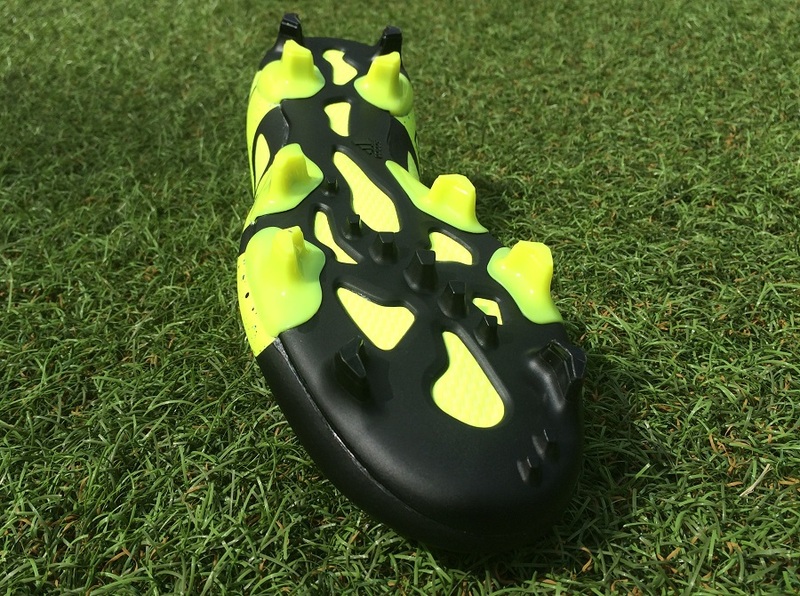 The Ace15 would be a perfect replacement for the 11Pro range, and how about add a little extra rubber on the front of the X15 and call it the Predator? We have been told that there is more to come from Adidas and that they are not finished “shocking” the market. For that reason, we can only wait and see where it all goes next. Since release, there have been several new colorways released in the series. 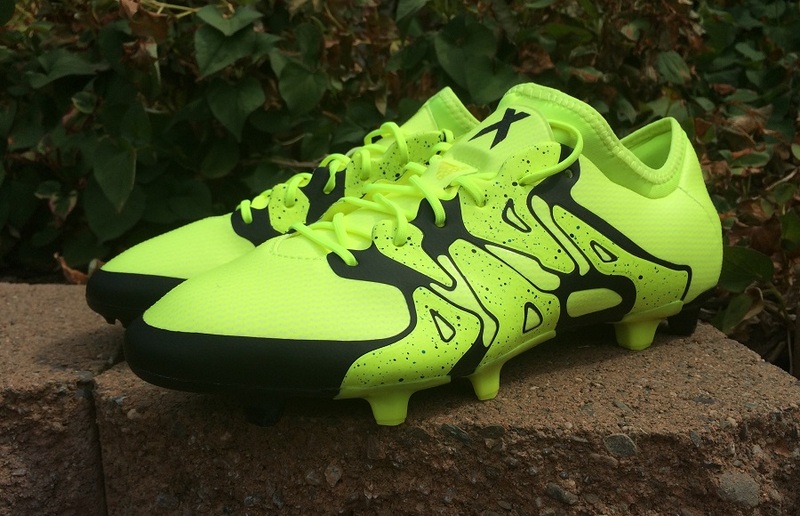 To check out everything currently available in the X15 line-up, head to soccer.com. Highlight: New age performance from adidas that correlates with their intentions to revolutionize the market. Forefoot offers solid touch on the ball, TechFit collar is a great addition and the traction system doubles on AG/FG surfaces. Category: Agility – all about dynamic turns and quick movements. Weight: 7.6oz – perfectly balanced! Would I Buy Them: I like what they have to offer, but I’d need to get the sizing right before making them a serious boot to consider. Player Position: If you like to get forward and attack, these are a pretty solid option. Everything about performance is geared towards players that like to influence the game. New age performance from adidas that correlates with their intentions to revolutionize the market. Forefoot offers solid touch on the ball, TechFit collar is a great addition and the traction system doubles on AG/FG surfaces. Honestly, I’ve had both and I still prefer my Nike Premier. Especially on AG. 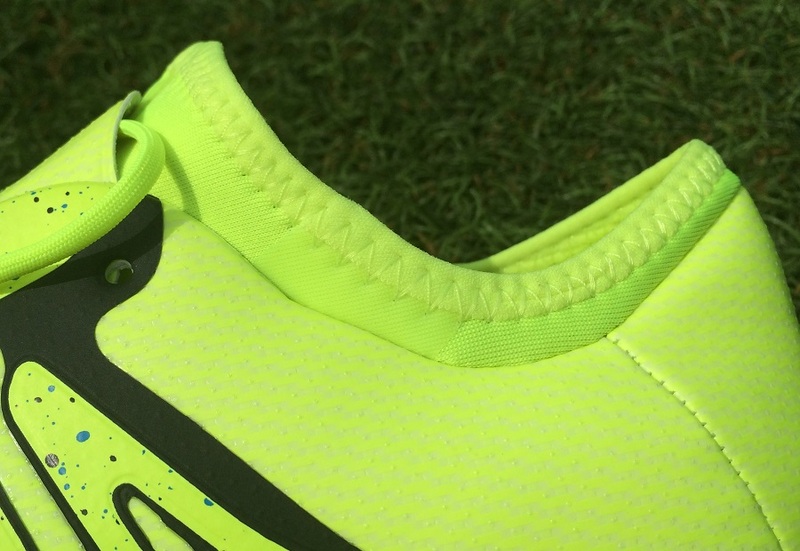 The new hypervenom look more durable than the first but they’re nowhere near as soft. The uppers actually a little “stiff” or harder. They might not be as flashy but the Nike Premier trumps both. No problem. If you have to choose from those 2 I’d def say the Adidas X 15.1. If you’re ever at a soccer store though, try on the Premier just for the hell of it. Comfort is on point! Great review, one of your more honest takes on a boot (in my opinion). I am eager to see the leather version review as well as the reviews for the Ace. Thanks for the work in putting this together! They are on the way! Ace15 is coming soon. You should definitely review the leather version of the X. The absence of the techfit collar and the leather in place of the X-Skin and the consequent absence of NSG might mean something else in terms of feel and performance. As for the leather Ace, the only differences should be in the fore and mid foot, since the leather means that there is no NSG, and also the absence of the synthetic upper means feel will differ. Bryan, so can I take it as you're saying that while these boots are geared towards the modern game, they are in no way better than the 2015 adiZero and the Predator Instinct? For what their purpose is, and who they are targeted to – no! The difference here is that the X15 is intended to be more of a hybrid, serving multiple functions rather than a specific role. and here i am still browsing ebay for deals on Total 90 Lasers. I watched a bunch of MLS games this weekend with an eye on what adidas-sponsored players were wearing . As far as I could tell, it looked like a mixed bag – difficult to tell any consistent patterns in terms of players who used to wear f50/preds/nitrocharge and which new adidas boot they were choosing. I did notice that just about every adipure 11pro guy was still wearing their old boots. Wonder if they can continue with that for a while. I now need a pair of these. Love the honesty, sets a valuable tone to the review and what we can expect. Keep up the good work. Took my kids to the local soccer store today and neither could even be talked into trying these on. If they look that bad to 13 and 15 year old soccer junkies, adidas is in a bad place. They did try on the Ace and both thought they were ok, but the fit wasn't good for either of them. My son ended up with Puma and my daughter Nike, btw. How is the durability? This year is my senior year in high school and I would like a really nice boot that will last me the season. Most of the expensive boots are only made for a few games and then fall apart shortly after. Will they last me the season? Very decent – in terms of market value, they look like offering top quality durability! I agree with Bryan, these shoes run about 1/2 small, I’ve worn every F50 adizero version since 2010 in US8 but had to get these in US8.5. With the “normal” size 8 I felt my toes were going to rip thru the upper. My closest comparison in Fit (length-wise) is the Nike Maestri III. If i wear 7.5UK for nike cleats do i need to increase to 8UK for this cleat? I found that they fit tight, so a half size in US should be considered; how that corresponds to UK sizes, I can't be super sure. What do you think is better for pace, shooting, over all comfort and skills, the Adidas X 15 or the Nike Vapor X or any other suggestions. Did the boots 'give' at all after the first few games? I've just bought them, worn once and they feel very tight at the front area. I don't know whether to keep wearing them hoping that they'll stretch or to try to sell them now and recoup some of my money. is there any heel slippage in the x 15? I'm highly considering buying this boot, but I have really wide feet. Is this a wide boot? 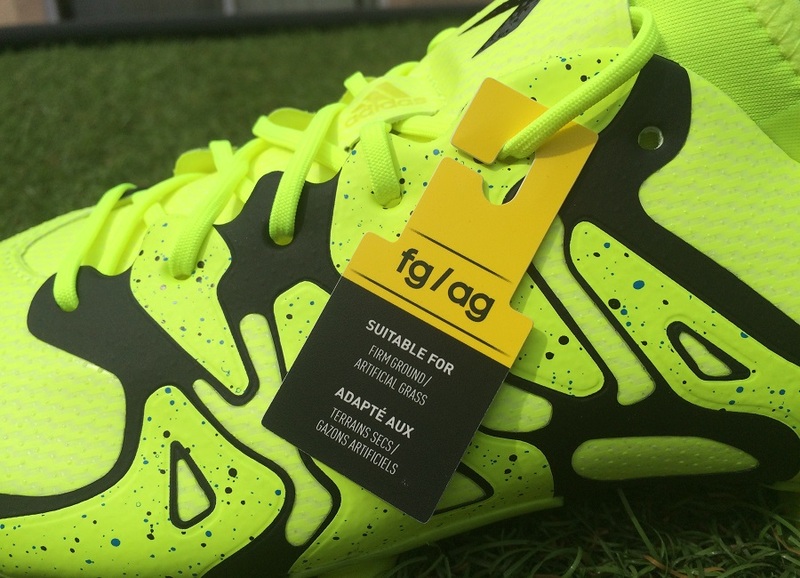 so if you had a choice, will the fg/ag x15 cleat perform similar to an ag cleat on articficial grounds ? I'm not a big fan of AG soleplates in general, so I'd say yes to choosing the FG/AG.